A patient’s right to consent is basic. But legal, ethical, cultural, administrative, and interpersonal issues mean it’s anything but simple. The year was 578. Justin II, the emperor of Byzantium, was in excruciating pain and begged court physicians to operate. They resisted treating him, though, fearing severe punishment if they failed, according to John of Ephesus, the ancient historian who recorded the saga in his Historia ecclesiastica. So what did they do? They asked that he hand them the scalpel they would be using for the surgery as a sign of his free and complete consent. Certainly, medicine has come a long way since then. Still, a patient’s informed consent continues to lie at the heart of medical ethics, individual autonomy, and patient-physician trust. Consent also brings an extra layer of complexity for medical schools and teaching hospitals, where trainees frequently observe and participate in treatment. From a simple tonsil check to lengthy bypass surgery, patients have a right to say whether or not they agree to trainee involvement in their care. The underlying principle of consent isn’t particularly complicated: Patients have a right to make an informed, voluntary decision about their care. That means they need to know the nature, risks, and benefits of their options — which includes declining treatment. But add in legal requirements, administrative issues, written documents, oral communications, exceptions like emergency situations, and efforts to respect patients’ particular cultures, and informed consent quickly turns complex. So, how do hospitals decide how to handle consent? At Penn Medicine, as at other teaching institutions, patients are informed early that trainees will be involved in their care. “We tell them right up front in the general consent form that we are a teaching hospital and that residents and other trainees will participate,” notes Betty Adler, JD, Penn Medicine senior counsel. Regulations from the Centers for Medicare and Medicaid Services (CMS) also mandate such disclosures. For example, if residents will be performing certain key tasks — implanting a device or dissecting tissue, among others — the CMS requires patient consent. Still, some patients can be squeamish about less-experienced team members. In one study that asked patients about hypothetical scenarios, 94% said they would agree to the involvement of a surgical resident in their procedure. However, when the hypothetical involved the resident performing the procedure with the surgeon assisting, agreement dropped to 32%. At teaching hospitals, informed consent isn’t only about explaining to patients how trainees will be involved in a procedure. It’s also about making sure trainees learn to properly obtain consent. “Attendings often involve learners in the process,” says Rozovsky. “‘See how this patient was able to absorb the information?’ ‘Look at this patient’s confusion.’ Observing the consent process acquaints them with conveying information that’s accurate and understandable,” she notes. Lessons on how to obtain informed consent usually begin early in medical school, explains Whelan. What’s more, 58% of participants in the 2018 AAMC Curriculum Inventory taught the topic in multiple years. Approaches include didactic lectures and practice sessions with trained laypeople known as standardized patients. The informed consent process is not without its thornier aspects. At times, malpractice suits shift the landscape. For example, in a 2017 Pennsylvania case with possible implications in other states, the court ruled that the physician performing a procedure — not a delegate — must personally ensure that the patient understands the risks involved. 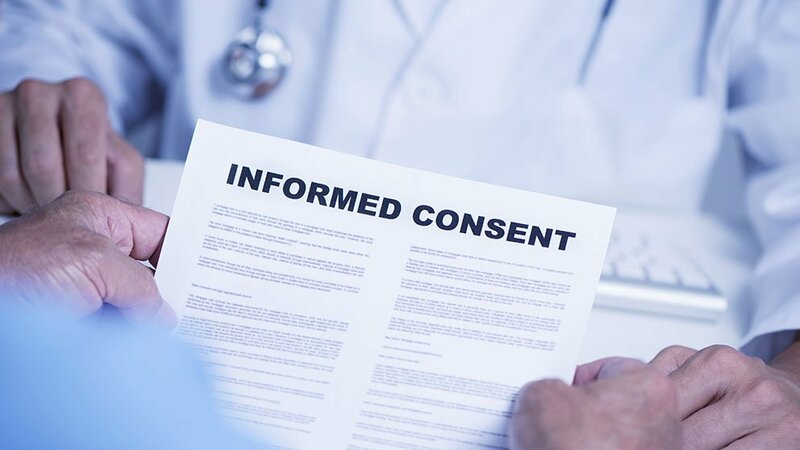 And sometimes, informed consent grabs headlines, as happened recently with allegations that medical students are performing pelvic exams on anesthetized women without consent. That claim, Orlowski notes, relied on studies from more than 10 years ago, before such changes as more detailed consent forms. Typically, she says, students practice pelvic exams with special mannequins and standardized patients who are specifically trained for this purpose. When students and residents do perform pelvic exams on surgical patients, Orlowski adds, specific consent must be obtained first. “Performing pelvic examinations under anesthesia without patients’ consent is unethical and unacceptable,” she says. Marie Walters, a student at Wright State University Boonshoft School of Medicine, says she was perplexed by the allegations, so she checked with fellow students at her school and elsewhere. Her explanation: medical students may not know that patients agreed to such exams. “Although students witness some consent processes, we’re likely not around when patients give consent for the surgeries we observe,” says Walters, who is a member of the AAMC Board of Directors. "We may be there just for the day of the surgery,” she notes. Looking ahead, medical schools and teaching hospitals continue to explore ways to improve the consent process. Options include worksheets that help patients weigh choices, as well as the “teach back” method, in which patients repeat what they’ve understood. Consent processes also need to ensure that patients have ample opportunity to think through their decisions, experts say. That’s why a recently developed CMS checklist intended to improve the process includes giving patients consent forms at least one day prior to an elective procedure. Other possible advances include switching from paper to electronic forms. “These are more legible and less likely to get lost,” says Fink, who serves as chief medical officer of a company that produces thousands of such procedure-specific forms.